'That guy is riding with only one brake,' said the shorter of the two geared-up racers. 'Well, I'd rather have just a front brake than just a rear,' said the taller. I guess he had a point. A front brake does most of the stopping, after all. But I don't think either of the pair realized that they were looking at a fix, or that its owner was standing right behind them. This was the first of several amusing comments I would hear during my first attempt at riding fixed in a cross-country mountain bike race. At this stage my super-secret ninja bike was still undercover, although some guy I think was Richard Sachs had already ridden by me and spotted what was up. 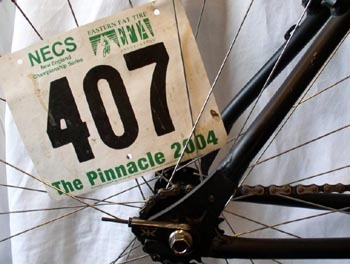 I had decided to enter the singlespeed category at the Pinnacle Race in Newport, NH. Since my bike had just the one gear, that seemed the way to go. Being fairly new to the whole offroad fixed gear thing, I was counting the race as an experiment. I just wanted to see what it was all about and ride some new trails. So I cruised casually up to the start line and waited for our group to head off into the woods. I figured I was fitting in pretty well, when the guy next to me belted out, 'Is that a fixed gear?' Rats, my cover was blown. I'd thought I would make it through the start without too many other people discovering my secret weapon. I had to tell him yes, of course, and I started getting a lot of attention. Some people were confused. Others thought I was confused. Others still just edged away. Maybe they were the smart ones. I didn't have the slightest clue about how I was going to keep my bike on the trail over a 20 mile course. Sure I'd done a couple 15 mile fixed mountain rides before, but I had taken my own sweet time. My head wasn't pounding from constantly trying to go faster and I knew the trails. I wasn't sure what I was getting myself into. Shortly after the experts left the start line, off we went along with the junior experts. Jockeying with the pack on a fix was a new experience. Not only was I trying to pick a good line into the singletrack, but I kept accelerating into the guy in front of me every time he started to freewheel. After three or four bumps I made my way around him and up to the front. I found the going easier up there. H'm, I thought. Maybe my jokes about a secret weapon weren't so much of a joke. If I'm pedaling all the time, I will never slow down. Maybe I'll stay ahead of the pack. I had raced the Pinnacle course last year on my singlespeed, so I had a pretty good idea of what to expect. The course comprised two 10 mile loops. Both were about 90% technical, woodsy singletrack. The remaining 10% was doubletrack climb. On my first visit, I'd enjoyed the course a lot: the singletrack wound continuously around itself flowing over rocks and around closely spaced trees, and there were great sections like the part where you traverse a smooth rock face up and emerge onto a wooden bridge. This year, the organisers had added an open section which descended a series of rock ledges and back into the woods. There were even a few North Shore-style ladders to deal with. All in all, I was excited to see how I would manage it on a fix. Since I had managed to get way out front at the beginning, I was having a fantastic time on the singletrack. Time the left pedal to be up here; skip the rear wheel to get the right pedal down there; everything was connecting nicely. Riding a fixed bike through the woods is great when done properly. The rider, bike, and trail feel completely at one. There is no noise from shifting, no brake pads squealing, just the smooth purr of the chain over the sprockets. As I neared the close of the first lap, I was feeling pretty confident. So far I 'd been able to ride everything on the course. I knew I'd have to slow to a creep on the final steep downhill just to keep the pedals under control, but I felt like I was keeping up a respectable pace. Then I clipped my pedal through a corner. My right foot was immediately ejected, while my left foot flailed as it attempted to keep up with the bike. I was still trying to get the bike back under control when the front end slammed into a nice tombstone rock. What happened next I don't really know. I must have been in the air at some point because I was not longer pedaling and my right foot was still off the bike. Luckily the trail leveled out and I managed to get back under control and both feet clipped in. There were a couple guys behind me who I think were quite impressed with the save I'd pulled off. I had to take a breather to refocus my vision as they went by me. I think that's where I relinquished the lead in the singlespeed category. Still a little shaky, I continued on and made it down to the bottom and headed out for another lap. I was still able to ride everything on my second lap, but kept it a little more mellow on the downhills. Slightly over two hours of riding and I finished second out of eight singlespeed starters. Not bad, I thought. As I expected, it was on the downhills that things became difficult. Short downhill sections were fine, but when I got on the longer sections and the speeds picked up, it got pretty difficult to keep the pedals spinning and still avoid all the rocks and roots. It was a very different experience racing fixed. I had to keep reminding myself not to stop pedaling. This is fairly easy on a regular ride, but under race conditions sometimes you forget. I will say, however, that a fixed gear bike feels faster when climbing. All that built-up momentum just keeps the pedals churning. It was almost an unfair advantage. The Pinnacle is run in Newport, NH by the Eastern Fat Tire Assoc (EFTA) as part of the New England Series. Each of the nine races they promote during the season includes a S/S category. Kevin's Bianchi DISS fix has been modified since its first appearance on the Rides page. Kevin now runs a 49" (36x19) gear for easier climbs and better control in descents, and has switched to knobbier tires: a Tioga Factory XC Extreme 2.1 on the front and an IRC Mythos 2.1 on the rear.